kondratieff cycle « CONSTABLE RESEARCH B.V. The Industrial Revolution started with the mechanization of the textile-industry (1740-1790) in England. A new collaboration concept the Mill, later translated in the Factory, is invented. The Industrial Revolution is preceded by the Renaissance. The Renaissance is a Creative Phase. The Industrial Revolution is a Social phase. A Social phase changes the way people cooperate. Small scale cooperation structures were destroyed and replaced by large-scale cooperation structures. The Industrial Revolution not only changed the way people cooperated in labour. It also changed the way Cities and Countries cooperated. At the end of this phase (the Second World War) Europe and the World (UN, China, and India) started to Unite. Cooperation on the Level of the World became possible but was finally not realized. The French Revolution (1789) breaks the power of the Aristocracy. The Bourgeois (the merchants, the entrepreneurs, the middle class) use the Mill to produce cheap standardized products on a large scale. They became the new Rulers of Society. The mill and later the factory not only destroyed the Aristocracy. It also destroyed the Small Scale Collaboration Structure of the Guilds. The Guilds, operating on the level of the City, took care of almost everything at that time. They operated hospitals, educational facilities and insurance. When the mills turned into factories many people lost their job. The big cities were populated with very poor and hungry people. Nobody took care of the sick and the old. They became the Prolitariat, the Under-Class. The existence of the Prolitariat produced a huge tension in society. This tension was resolved when many pressure groups or movements (Conservatives, Liberals, Socialists, and Communists) finally agreed upon new large scale institutions. The State, Parliament, Democracy, Voting, and The Union came into existence. The Social Welfare State was constructed. Government took care of almost everybody. The first Cotton Mill was opened in 1742. In 1762 Hargreaves invents the spinning jenny. It was operated by hand. With the invention of the steam-machine (1769, Watt) manual labour was not needed anymore. In 1785 the first mill was opened that used a steam-machine (the power loom). 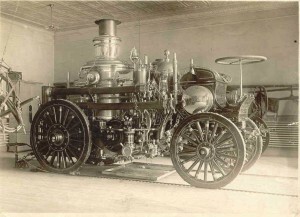 The Steam Machine became a Major Paradigm. It highly influenced Physics (ThermoDynamics, Entropy) and Psychology (Freud). In 1781 Kant wrote his book Kritik der reinen vernunft. He excluded the Imagination (illusions) and the Emotions (love, care, values, quantity) out of reasoning and introduced the concept of mechanized thinking (Logic). Kant excluded Art (Imagination) and Religion (the Emotions) and invented Science. Mechanized (Scientific) Thinking was used to Optimize the Mill. Slowly it grew into a (big) factory. At the end of the Industrial Revolution Logical reasoning produced its most briljant artefact, the All Purpose Computer. The Computer became a major Paradigm. Between 1790 and 1840 the world was covered with Railroads. They facilitated the spread of the Industrial Revolution. Cities flourished and died according to the distance to a railroad station (A node). Many infrastructures were created in this period (Telephone, Sewers, Water, Gas, and Electricity). Later the concept of the railroad was implemented in Traffic (Highway) and Computers (networks, hubs, servers). 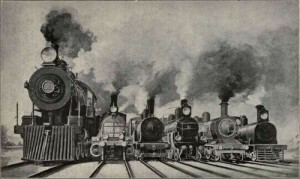 The Railroad Network became a major Paradigm. Mechanic thinking resulted in Standardization. 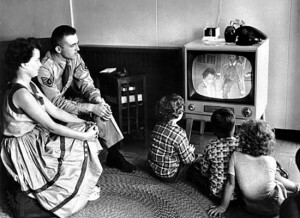 Between 1890 and 1940 Mass-production, Mass-consumption and Mass-media dominated society. 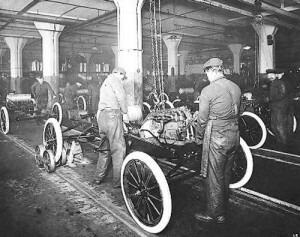 The first step was set by Henry Ford and Frederick Winslow Taylor with the production of the T-Ford. The theories of Taylor are until now (most of the time not recognized) used in many forms to optimize work-processes. The end of optimization is reached when everything is turned into a Utility. A Utility is a Network that operates without Human Beings and transports Objects. When we look at the Industrial Revolution from a higher perspective we can see the elements of the Cycle at work. A phase of Creativity is followed by a Social Phase. It is the phase of Power Conflicts (Competition) and the construction of new Movements, new Groups and finally of new Institutions (The State, The Corporation). The Hierarchy was the major control paradigm of this period. Everybody wanted to move to “the Top”. The Race to the Top was also visible in architecture. The SkyScraper with the Management at the Top became the Symbol of Power. The Industrial Revolution gave the Masses, the Slaves of the Middle Ages a better place. They changed from a Slave into a Consumer. The Slave was dominated by his Owner. A Consumer is dominated by his Senses. On the Macro-level we see a move from the world-view of Control/Social (Master/Slave) to a Sensory/Social-pattern. 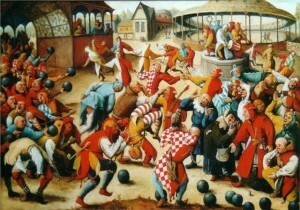 Will Mc Whinny called the Game of Sensory/Social The Game of the Market. 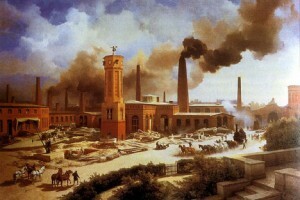 The Industrial Revolution produced the Game of the Market. 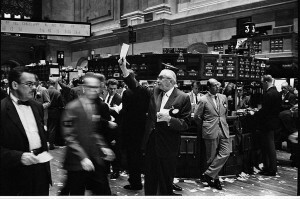 At the end of this period the Masses controlled the Market. We are now in a demand oriented economy. This created a big problem for the mass-producers. They controlled the masses and are desperatly trying to keep their position by Manipulation of the Media. On the level of the Kondratiev-cycle (Period 50 years) a phase of Creativity and the Individual was started in 1950. This phase ended around 2000. The move to the Individual challenged the structures of Mass-Production. People wanted to be treated as a Unique Human Being. Industry found a solution to this need. They invented Mass Customization and User Involvement and went on with the Game of the Market. This phase is now followed by a Social Phase (Start 2000). The Customer (the new Ruler) is organizing itself in Smart Customer Networks. The Very Long Cycle (Precession, Period 25.000 years) and the Cycle of Culture (Periodicity 1250 year) is also changing its focus. On the level of Culture we are moving to the Centre. We are converging on a new and unknown level, Earth. During the Social Phase of the Industrial Revolution huge collaboration structures were formed (EG, UN, NATO, China, India, …). These structures are challenged by the Individual in the Next Phase. The solution of this conflict is a network of small local structures that is part of a large global network (“Think Global, Act Local”). The precession cycle is moving from the Dark Phase into the Light. This is the most interesting and unknown development. Current Human history has never experienced a shift from the Kali Yuga to the Golden Age. The Golden Age is a period of intense spiritual development, a movement to a New Level of Conscioussness. It shows itself in a move to religion and mysticism but also in a new awareness about what is really happening in the world. This new awareness is frightening to most of the people. They cannot understand the major changes that are visible. The predictable future is gone. 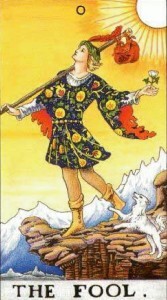 Everything is on the move and the movement is excellerating culminating in Point Omega, the Big Leap into Nothingness. Long Term Phases always dominate short term phases. The effect of this will be tremendous and almost unpredictable. An unpredictable future is a Future without a Perspective. Some people expect a dramatic negative change. They are waiting for the Apocalyps. Some people expect the Return of Paradise and a jump to a higher consciousness. I really don’t know what will happen. If you read my blogs I am constantly trying to find the solution of this very complex conjunction of cycles. I keep you informed. During the so called E-Commerce Bubble allmost everybody believed that when you sell something on the Internet you will become an instant multi-biljonair. I did not believe this at all. The funny thing was that almost nobody believed me. I waited for the Bubble to burst. To my surprise the E-Commerce Bubble became the biggest bubble I ever experienced. At a certain moment I even started to believe I was wrong and something really special was happening, The New Economy. Later I discovered the reason why the Bubble was able to grow to an extreme proportion. The Long Term Economic Cycle called the Kondratieff-Cycle was at that time in an UP-mode. The Economy was expanding and many people were looking for a nice investment opportunity. When the Bubble exploded the Kondratieff was moving Down and the Exploding Bubble excellarated the downfall.The Kondratieff will start to rise again around 2020. Until that time we will be in a state of Recession. The people that promoted E-Commerce believed that Commerce was all about Communication. Just Tell Everybody You are There and Business will Come. But When Everybody is telling Everybody that they are selling Something Nobody will Find you. To find you they have to know what they are looking for. People used a search-engine to find what they were looking for. E-Commerce created a new problem. The problem was “how to Manipulate a Search-Engine”. The problem was solved by the Search-Engine itself. Just Pay us and we Put You on top of the List. At that time I did not realize that the biggest money-maker in E-Commerce would be the creation of a “fraudulent” search-engine. At that time we believed the only type of company that would benifit from E-Commerce was a Mail-Order Company. Amazon.COM was our favorite example. I knew that the Old Companies were unable to create a Website with a connection to the Back Office. Their Legacy Systems would block them. I reseached Logistics, Languages, Legal and Fiscal Issues and the big Cultural differerences between the many Countries in the World you could reach with one simple Website.I found out that there are a lot of questions you could ask about Commerce that many people never asked because Normal Commerce was “Just Happening”. We are immersed in Commerce and take many things for granted. I got in contact with people in the US that where doing the same research. We decided to create a European CommerceNet. The EG asked me to participate in a big effort to solve the problems of SME’s in E-Commerce. We identified many issues that had be resolved. Economic Bubbles are happening all the time. The simplest explanation for the appearance of a Bubble is The Bigger Fool Theory. When you buy something and your investment becomes questionable you believe you will always find a “a bigger fool” who pays the price of your life. Humans are positive thinkers. They believe they will always make a profit. The bigger fool theory is an example of a positive feedback mechanism. Everybody feels things will go up. If this happens they want to become part of the tremendous success. What many people don’t realize is that positive feedback has to be compensated by a negative feedback. Everything in the Universe is expanding and contracting. People who are entering in the beginning of the rise make a lot of money. People that join when the decline starts lose everything. A Bubble is a very complicated, unbalanced, unfair and sometimes even fraudulent exchange-mechanism. A fraudulent exchange mechanism is called a Pyramid-scheme or a Ponzi-Scheme. A Bubble is a Ponzi-Scheme where nobody is playing Mr.Ponzi. In the E-Commerce Bubble many people used the Ponzi-Scheme to make a lot of money. I don’t want to offend my collegueas but I am convinced many financial advisors knew the Bubble would burst some day and did not tell this to the people they were advising. They did not tell the truth for many reasons. They were completely ignorent about the technology and the effect of the technology on companies but the most important reason was sadly enough the fact that they were making a lot of money themselves. They became greedy. Greed is the Fatal Attractor behind all the Ponzi-schemes. Economic Theorists proved that the Ponzi-Scheme can also be applied to other areas of our society like The Housing Market and the Government Pension System. All of them will finally end in a Bursting Bubble. The people that will win are always first users. The Housing Market Bubble is already exploding, The Pension Bubble is on its way. Many people Project their Knowledge of the Now to History. They Think that People Thought the same Thoughts many years ago. To understand the Spirit of The Time we have to understand the Historical Context People lived in. One way of doing this is to look at a shared foundation and study the Historical Variations on the Central Theme. This idea corresponds with the Insights of Micheal Bahktin. He called the central theme The Chronotope, “The place where the knots of narrative are tied”. I used his theory to have a look at the Cultural Cycle of History. I combined the theory of Bahktin with the Economic Cycle Theory of Kondratiev. To my big surprise Kondratiev and Bahktin use a different periodicity (50, 250 years) of the Cycle but the stages of the Cycle were the same. What surprised me more what that the periodicities of the Cycles where related by the factor Five. When you know the basic periodicity the only thing you have to do is multiply or divide by five and the same pattern, the Basic Fractal of History, emerges. The Five or the Pentagram shows itself in every culture on Earth. When we transform this structure in three dimensions it shows itself as a Spiral or a Moebius Ring. A beautiful example of a projection of the Now on History was a visit to the Cave of Lascaux in France. An anthropologist was explaining to us what we were seeing. The Cave contained many Spiraling Abstract Paintings. She told us that the Cave was used for rituals and the many pictures we saw had a symbolic meaning. I did not believe that because the theory of symbolism was “invented” by de Saussure (1857-1913). The people that lived in the Cave had no idea of Symbolisms and Symbols. They just painted what they “saw” in the Outside World and the Inside World. If I place myself in their Context I cannot Imagine they were Thinking a lot. I feel they were Experiencing Nature in all his states of Wonder and Terror. Imagine what a beautifull Sky they were experiencing every Night and you will understand why the Sky Father was the major Force they felt. The people that lived at the time of the Cave of Lascaux always situated their Holy Places at the crossings of important Ley Lines. These Ley Lines represent the Spiraling Knots of the Electro Magnetic Field of the Earth (the Earth Grid) . Highly sensitive people can still feel the PowerPlaces and it is not strange to assume that the sensitive people at that time (“the Sjamans”) could do the same. Just like the Current Sjamans they could travel Space/Time by performing Rituals (Spinning, Chanting the Sacred Tones), Lucid Dreaming or by eating Sacred psychoactive plants like the Peyote and the Amanita Muscaria (the Soma). 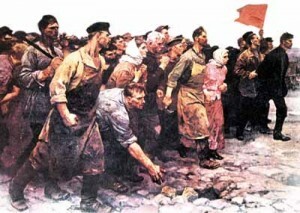 Symbolism was a theme of the Spirit of the Time of a stage in the development of the Kondratiev Wave that operated between 1890 and 1940. It was the time of Standardization (Control, Plan). The stage before this stage (1850-1890) was related to Energy (Ego, Self, Desire, Fire). It was the time when the Steel Mills were created, the research in Chemistry started and Alexander Noble invented Dynamite. I was able to map every phase of the Kondratiev Cycle to the Cycle of Bahktin. The 5 phases of the Kondratiev Cycle (5×50 =250 years) could be summarized at a higher level, the Industrial Revolution. I found out that the Industrial Revolution was a Social Movement. A Social Movement is always preceded by a Spiritual Movement, the Renaissance. I started to map the Cycle again with a periodicty of 250 years. The time-interval between 1450 and 1700 is called Renaissance. It is the stage of the Spirit and Ideas. The model fitted. I went back 5×250 years (200-450). In this time Christianity was created by the Roman Emperor Constantine I. He used the widespread Cult of Mithras to introduce Christianity in the Roman Empire. Again we are in the stage of the Spirit. The Model fitted. I jumped to a higher level of the Cycle (The Cycle of Civilizations) and travelled further back in time. I arrived at the time of the Cave of Lascaux. At that time many caves contained “abstract pictures”. The pictures look like Spiraling Spirals. Later the spirals where placed in a Medicine Wheel and connected to Animals (Eagle, Bull). The same animals appear in the Medieval Cathedrals but now they are related to the Apostles. Even the medicine wheel (a labyrinth) can be found there. If you walk this wheel in the Cathedral it will point you to all the important stories that are told. Just like the Medicine Wheel the Cathedrals (build by the (Free) Masons) where an educational tool to tell about the Spiral of Life. Suddenly I saw the big picture. Every step in the Cycle was nothing but a new way to show the “same thing” again and again. The spiralling spiral came back all the time but on a different level. What happened around 550 BC? At that time an Innovation in Religion came into the World. 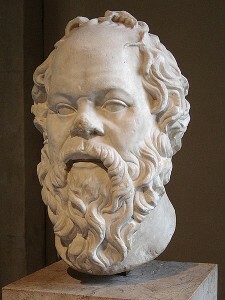 This innovation can be summarized by the famous statement of Socrate Know Thyself. The same statement can be found in the Gospel of Thomas and is also the central theme of the teachings of the Buddha. The Gospel of Thomas is a part of the Dead Sea Scrolls, a Gnostic Library of the Essenes, dated 50 BC. “Jesus said: Whoever knows the All but fails to know himself lacks everything . . . But the Kingdom is within you and it is without you. If you will know yourselves, then you will be known and you will know that you are the sons of the Living Father. But if you do not know yourselves, then you are in poverty and you are poverty“. Boeddha became an Inspiration in the East. Socrate and Jezus were killed. From that time on an enormous amount of people were killed in the West when they wanted to Know Themselves, find the Whole in their Inner World. They could not experience the Roman Religion through A System. Know Thyself was a huge threat to the Rulers of Western Civilization. Constantine simply took over Christianity to preserve the power and made it into a Roman System. A system of Laws to Obey. He practiced the old Roman trick of Divide and Conquer to save his Empire. Between 1450 and 1700, the Renaissance, the tides started to turn. It took another 250 years (1950) before the people in Europe started to find their own Identity again. We are now in the Stage of Individuality of the Cycle and are slowly entering the state of Empathy. It shows itself in the many attempts to create Networks (Communities). The Internet is one of the major Western technological inventions to support this. The Cycles of East and West (and North and South) are coming together. The Eastern Cultures embrace Western Culture and the Western Culture embraces Eastern Culture. We can create Harmony by a fuse of everything the Human Race has Learnt when a new cycle started around 550 BC. The Cycle of The Earth is almost at The Breaking Point. According to many environmental scientists we will soon experience a very fast Reorganization on the Level of Earth. The long term cycle of Earth is restoring itself. Not only Earth will restore itself. The original Spirituality of the civilization of MU, will be restored. An ancient Bhuddist prophesy speaks of the darkest hour of the Dark Age, when the rivers of materialism burst their banks, and plague, famine, greed and warefare beset desperate people everywhere. That Dark Age will soon end and the new Golden Age will appear. Many living buddhas are now here to bring the precious healing Dharma to anyone ready to receive it.